A referendum was held on July 2, 1883 that there be raised by tax the sum of $1,200.00 to pay the annual rent to Water Works Co. for thirty years for 30 hydrants to be used by the Village. This commitment by the voters made a public water supply economically feasible and the Wellsville Water Co., a private firm, was incorporated in September of 1883. On December 1, 1883 the Village began paying hydrant rental and the Water Company was in business. The first water supply came from a reservoir built on Crowner Creek about a mile southwest of the Village. The reservoir covered an area of about 1.75 acres, was 24 feet deep and had a capacity of 5 million gallons. Remnants of this reservoir are still in place today. Shortly after this reservoir was built, a law suit was instituted against the Water Company claiming damages for depriving water from Mr. Crowner. He was awarded $200 plus $800 court costs. As a result of this litigation and additional water supply was developed by installing nine driven wells near the bank of the Genesee River near where the current water treatment plant now stands. Eight of the wells were 20 – 27 feet deep and the ninth was 175 feet deep. Around 1905 – 1906 the Crowner Creek reservoir was removed from service due to contamination and the wells supplied all of the Villages water until 1916. The original water system cost $40,000. The yearly revenue from water rates was $3000 in addition to the Village’s hydrant rental of $1200. By 1906, 3,800 of the 4,355 Village residents were served by the Water Company, the average daily consumption was 510,000 gallons. Total earnings were $14,568.11 and expenses were $13,617.50. Because of dissatisfaction with the Wellsville Water Co. by Village residents, the Village tried several times to buy the company starting in 1910. The value of the system in 1912 was $75,850. On September 1, 1915 the Village Board decided to purchase the Wellsville Water Company. The voters overwhelmingly approved these purchases. The purchase price for the water co. was $75,000. In 1916 a slow sand filtration plant was built at the top of Lee Place at a cost of $75,000. This plant did not perform as expected. The Genesee River proved too muddy for the plant. Ice damage to the filters caused cracks in the walls and floors allowing a large amount of leakage, which amounted to 100 million gallons a year. This leakage caused substantial damage to private property on E. State St. leading to more lawsuits against the Village. In 1916 a new intake dam and chamber was built using 2 inch thick pine planks. The 3 million gallon open reservoir (190 ft. diameter, 15 ft. deep) on Lee Place was built as a part of the slow sand filter in 1916 and it is still in service. It was relined with Gunite, a sprayed concrete, in 1928, at a cost of $25,000. The Village hired engineers to come up with a solution which was to abandon the slow sand filter technology because it was both obsolete and not adapted to cold climates. They recommended a 1 million gallon per day rapid sand mechanical filter plant. The Village Board agreed to build this plant at the site of the electric plant on W. State St.. So after five years the slow sand filter was history. The foundations are still evident and the dedication plaque is displayed in our new treatment plant. On May 21, 1921 the Village voters approved %40,000 in funding for the new plant. The successful bidder was J. F. Williamson Co. of NYC with a base bid of $35,979. Construction proceeded with minimal problems and this plant proved to be a great success. It operated successfully with minimum maintenance until July 1990, a period of 69 years treating about 25 billion gallons of water. This was a very difficult plant to maintain because of the cramped quarters and lack of access to the process units which is the reason that the filter sand was only replaced one time. The average daily consumption in gallons was 461,000 in 1922, 981,000 in 1948 to 1,000,000 when the plant was removed from service in June 1990. This plant was running at full capacity 7 days a week, 24 hours a day which made maintenance very difficult. In 1929 a concrete intake dam was constructed jointly with the Sinclair Corp. because it was determined that a major expansion at the refinery would have a negative impact on the water quality. This intake supplied water to the Sinclair power house and the Village treatment plant. This line was a 16 inch wooden stave line. In 1948 an additional 750,000 gallon steel tank reservoir was built. This gave us a storage capacity of 3,750,000 gallons. In 1956 the U.S. Army Corps of Engineers built a badly needed flood control project on the Genesee through Wellsville. The Corps had to redesign this project after completion to provide increased capacity. This required the Village to move their existing intake, so two years after the “Hurricane Agnes” flood of 1972, a new intake was built adjacent to the treatment plant. In 1967 the Water & Light Board hired a consultant to search for a ground water supply since it would be cheaper to have wells than a new treatment plant. These results were not encouraging. The flood of 1972 put the new treatment plant on hold for some years. In 1981 serious erosion of the old Sinclair landfill and pollution of the river was discovered. This problem was placed on the “Superfund” list and given a high priority nationwide because of the threat to the water supply. New York State DEC, using funds supplied by ARCO, successor to Sinclair Refining Co. built a new intake, pump station and transmission line upstream of the refinery site. This intake was turned over to the Village in 1988. The 1974 intake and pump station was retained as an emergency backup. in 1982 the Village started planning the replacement of the rapid sand filter plant. Lozier Architects of Fairport, NY were retained to assist in deciding on a water supply source and designing the required facilities. A ground water supply was briefly considered but the ground water pollution found at the old Sinclair oil refinery site during the “Superfund” investigations made a ground water source near the treatment plant site very unpromising. Geologists were not optimistic about finding adequate water at any single location. Consequently the Village decided to stay with the Genesee River as its source. Bids were opened on April 18, 1989 for the new treatment plant. The successful bidders were; General Contract, MED Constructors of Buffalo, NY – $2,162,000; Electrical Contract, Box Electric of Bath, NY – $218/,300; Plumbing & Heating Contracts, Sky Plumbing of Wellsville, NY – $106.014. A total bid of $2,486,314. Construction began in June 1989, the new treatment plant went in to service June 1990. This treatment plant has now been in service for eleven years and it has proven to be very successful. This plant has a 500,000 gallon clearwell which gives us a total of 4,250,000 gallons of storage when combined with the reservoirs. We have plenty of room for growth as we are currently operating 80 hours per week. In 1990 two additional raw pumps were installed at the new intake bringing the total pumps to four. Two 15 hp and two 25 hp pumps. The steel reservoir was removed from service and demolished because of structural damage in the fall of 1997. Our storage capacity is now down to 3,500,000 gallons. On February 6, 2001 bids were published for the construction of two 2 million gallon concrete reservoirs. One will be built where the steel reservoir was and the other will be constructed inside the current location of the 3 million gallon open reservoir. These reservoirs will allow us to discontinue chlorination at the reservoir because they will not be open to the outside elements. On February 20, 2001 the bids were opened and Natgun received the contract, construction should begin very shortly. April 4, 2001 land preparation began for the first of two 2 million gallon reservoirs. June 8, 2001, the first reservoir is very near completion. The force main and distribution lines are being connected to the tank. This tank should be in service near the end of June 2001. March 2001, Dana Harris was chosen as New York Rural Water Association’s “Operator of the Year”. This award is presented to water operators in systems serving 10,000 persons or less. June 26, 2001, the open reservoir is officially out of service as of 0900 hours. We are draining the remaining water and construction of our second Natgun covered reservoir will begin. The Village is now on the first Natgun reservoir as of 0900 hours. The second reservoir will be constructed in the location of the open reservoir. October 19, 2001 – The second Natgun reservoir is now on line. We have stopped chlorinating at the reservoirs because they are both covered. March 2005, The Wellsville Water Treatment Plant was chosen as New York Rural Water Association’s “System of the Year”. This award is presented to systems serving 10,000 persons or less. 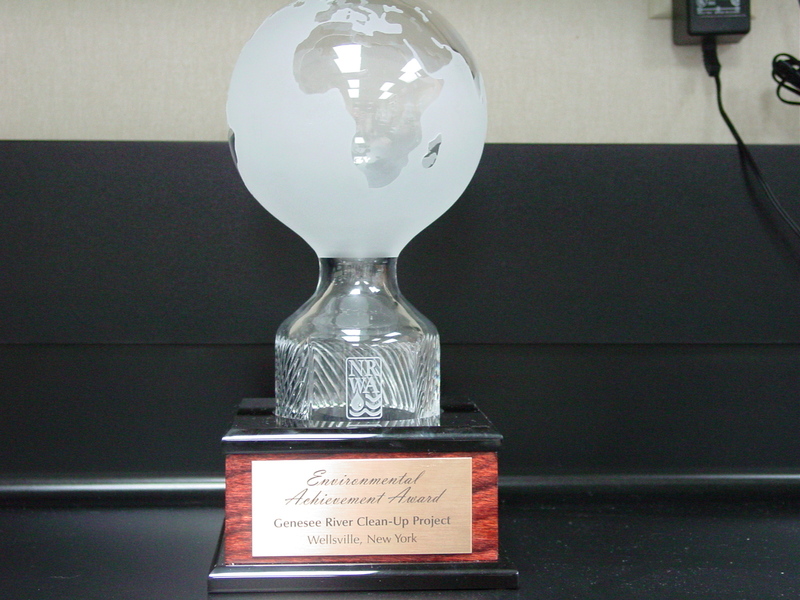 September 2006, The Wellsville Water Treatment Plant received the National Rural Water Association’s environmental cleanup project award, presented in Dallas. All fifty states submitted projects for this award. The project involved cleaning up a “community” dumpsite along the back river rd. which effected our watershed area. Many thanks to the Boy Scouts, Willing Fire Police and local neighbors. May 2012, The Wellsville Water Treatment Plant received the New York Rural Water Association’s “Friend of New York Rural Water Association” award.